Where do your Red Tents meet: Moon Temple – in a venue – we meet always in the same place. 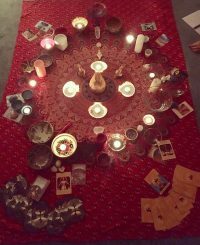 Choosing of an Goddess or Earth Magic Oracle Card – With the intention that the Goddess or Earth Based Symbol will be a teacher, guide and friend to you this Moon cycle. Centering – Eyes closed, Head into Heart, out of judgement & into compassion. experiences in circle, but we never repeat words or experiences of a sister in circle, ever. Intention Setting Ritual – water ritual , fire ritual. I love the red tent movement! the empowerment women feel after attending a gathering is palpable and its so fulfilling seeing the joy women experience from attending a tent!